The first part of the book is about Ava's family history and how strange it is. Ava was born with wings. Her grandma had lots of siblings but all died, so her grandma had decided to stop loving people as she thought that she was the cause of their deaths. Ava and her mother are shunned by the local people because they are different. I'm up to the part where Ava's mother decides to open a bakery even though most people don't want to know them. I think the rest of the book will be about Ava. Rated: 4½/5 - "really good and interesting so far ... "
The main character is a girl named Bella and she finds out the boy she likes is a vampire and all the problems she has dating him. There is also another guy who becomes a werewolf and vampires and werewolves are enemies. It's extremely good - in fact it's the best book ever! It's a pre-teen/teen novel so not suitable for younger readers. Rated: 5/5 - "Intriguing. I like it more than Harry Potter (which was one of my favourite books). This book keeps you on the edge of your seat because it's so unpredictable." In this book Bella starts getting depressed. I don't want to give too much away. I haven't finished and I don't know what is going to happen. Rated: 5/5 - "It's very exciting and I'm actually really liking this book." This book starts in the 19th Century with a young boy who is playing hide and seek. He becomes lost and bumps his head. When he wakes up there are 3 women singing. He tells them he is lost and they give him a harmonica to guide him home but the catch is that he has to pass it on to someone else in need. The 3 women were daughters of a Queen who have had a spell put on them and the only way to break it is to pass the harmonica on. Some of the other people that the harmonica gets given to are Friedrich, who is living in Nazi Germany, he has a deformed face and people like him are being forcefully sterilised. Then there is Michael and brother Frankie who live in an orphanage in Pennsylvania. Then Ivy in California who has moved a lot, and Kenny a Japanese-American. Kenny keeps the harmonica in his pocket and it saves his life when a bullet hits him. Rated: 5/5 - "The beginning and the end come together and I really liked that. Great book." I've read 12 books in the series and I like most of them. Alice-Miranda has started school early and she finds out that the Headmistress has not been seen for ten years and that the prize winning flowers are going missing. 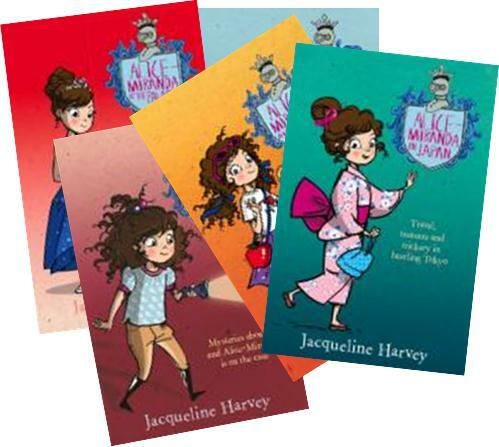 Alice-Miranda is able to do hard tests and she goes on adventures and solves things. Rated: 5/5 - "It's fun for the reader to read about all the things she does." This book is part of the Our Australian Girl series. This one is about Ruby who lives in Adelaide in 1930. Her family are well off but it's the start of The Depression. Her father sells cars but because people are losing their jobs and becoming poor they cannot afford cars, so is not making money. Ruby has to quit her private school and go and live with her auntie and now go to a State school. Rated: 5/5 - "I like how they talk about the past and how people lived. At the end is a quiz and you can see which Australian Girl you are like." Andy and Terry live in a 13-storey treehouse and they write books. Their cat goes missing and they need to finish their book and give it to Mr Big Nose. Rated: 4¾/5 - "It's a good book because I don't like reading big words and they do lots of dumb things." Creel is a girl whose parents have died. She is sent to live with her auntie who thinks she is a nuisance and another mouth to feed. Her auntie takes Creel to the dragon cave to sacrifice her in the hope that a knight will save and marry her and bring money for the family. Instead Creel befriends the dragon. She and the dragon go to another land where she tries to get a job as a seamstress. She is really good at embroidery and the king is impressed. Creel also has to stop the knight from killing dragons and hold on to a pair of magic slippers. Nick lives in Florida with his dad and older brother who has remarried. He now also has a step-sister named Lauren. Nick and Lauren find a four-leaf clover which gives them vision to see fairies. They find a nixie (a type of fairy) who is in trouble because she is not near water so they bring her to a lake. But the nixie gets them into lots of trouble and adventure. Rated: 4/5 - "Sometimes a little bit boring."